Highway Farm -A very special place. A few years ago I stumbled upon the Highway Farm Activity Centre page on Facebook, I'm not even sure what it first was that caused us to connect but pretty soon, Martin & I were exchanging comments on each other's pages & another 'cyber friendship' was formed. By sheer chance we both happened to be on the first #PlayIcełand conference organised by Fafu in October 2013 and so our friendship was cemented in Iceland over the 4 days. 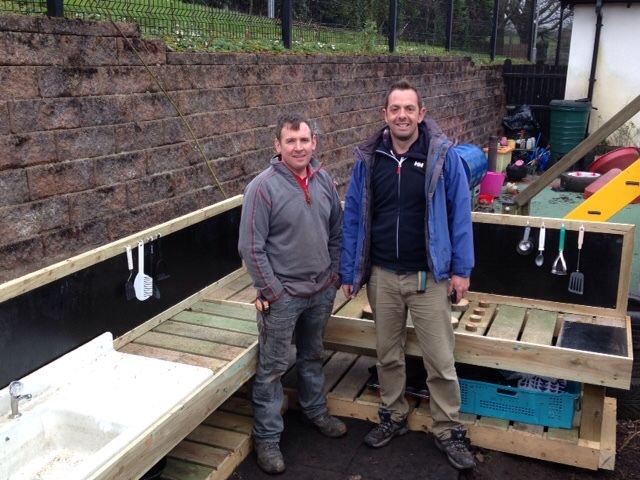 In March 2014 Martin came over to stay with me for 3 days & visit my school and whilst there he and a parent built an amazing mud kitchen for my nursery class. I was supposed to visit Highway Farm in July 2014 but unfortunately that very week, my father-in-law died and I had to cancel. 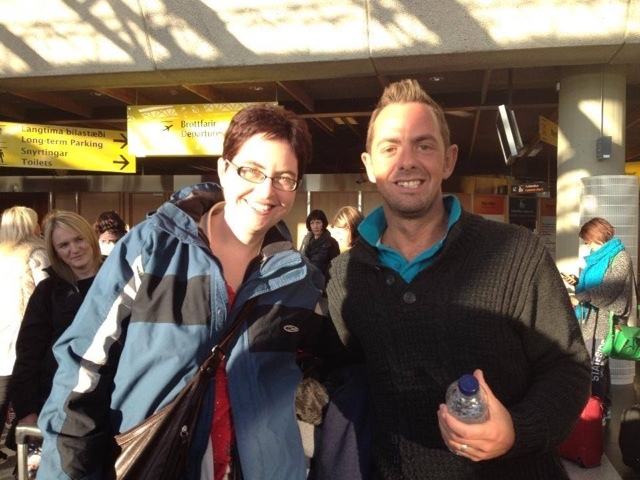 We both continued to chat on a regular basis and bounce ideas of each other and I was delighted when Martin invited me over this month to take part in his staff training with Juliet Robertson from Creative Star Learning Company. I jumped at this chance to spend time at Highway Farm and meet up with some inspiration practitioners, as the training was on a Saturday, my school were good enough to give me the Monday off in lieu so I could spend a morning at the preschool. 7 years ago, I got the opportunity to work in an Norwegian kindergarten in Eikefjord job shadowing a colleague working with the outdoor class. From the outset I was bowled over by the tranquil pace of the day, there was no sense of children being hurried through one process to get to the next, as often happens in our system. 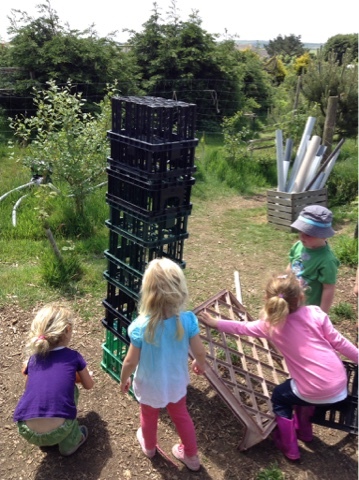 So roll on 7 years and it was incredible to see that same gentle child-led pace at the preschool at Highway Farm. Everything is seen as a learning opportunity, tidying up, getting dressed for outdoors, washing hands, getting ready for snack or lunch but not in the sense of 'how many grapes do you have, what shape are your sandwiches' (sorry inspectorate but this is one way to ruin proper conversation at snack or lunch), this was deep learning opportunities: whose name starts with a certain sound, who had a certain colour of shoes etc. Most of all, it was obvious that all the adults are working at the pace of the young children in their classes, not at the construction of a set timetable. There is a routine to the day but it is flexible and lunch happens when it suits not at the dictate of a bell. The site seemed so familiar from the photos I had seen on their page and from a wonderful album Martin had given me for my class in Iceland but it is surprising much smaller than it seems. 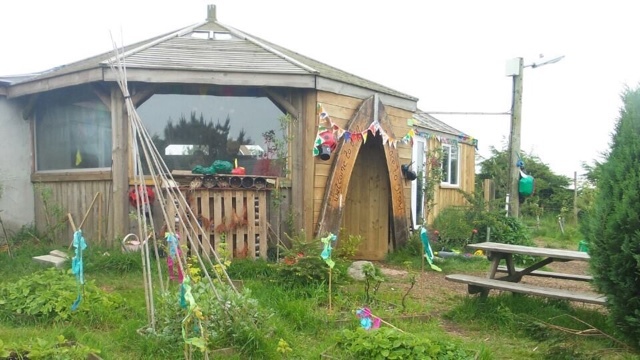 I think the use of zoning off spaces is incredibly well done at Highway Farm & each space then feels so different and the children must feel as if they are on a visit to a totally different area each time they move between the spaces. 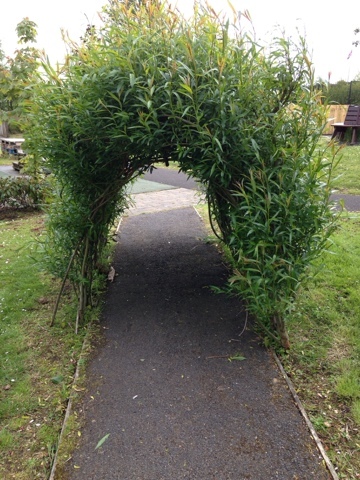 Within each area itself there are so many other little spaces where children can be out of sight, it has to seem like an enormous & magical place to those 3 -4 year olds lucky enough to spend time in this setting. What I particularly enjoyed was the 'real ness' of it, there are nettles, brambles, gorse, wood with splinters, metal shovels etc. 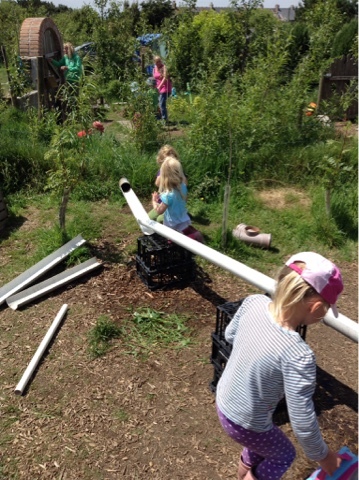 it is not a sanitised space, as many preschool setting are. 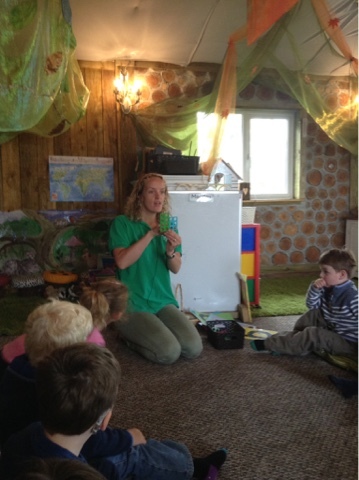 The children at the preschool learn all about nature and how to interact with prickly foliage or stinging nettles. Some of the climbing equipment is made from pallets & could be described as 'rough and ready' but what struck me was that if a piece does get broken it can be easily replaced at no great expense. 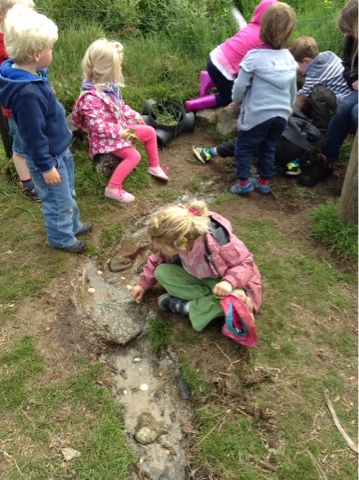 I loved watching the children play with a dry creek bed, as I had 'watched' this being built on the page one summer. There is something so engaging about water, I don't know of any child who does not love transporting water from one place to another. 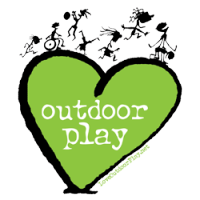 I spent a morning at this wonderful setting and I never heard any of the 30 odd children complain of being bored, or crying about having fallen - the lack of hard standing definitely helps, when children fall it is onto grass or bark chips. their reactions to this incredibly special place. A massive thanks to the Besford family for their hospitality and the Highway Farm staff for their patience at my many questions! 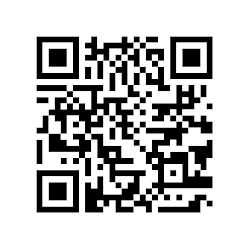 We all need to share our practice. As an educator I have fortunately always seen the value of sharing practice, ideas and experiences with others, both colleagues and parents. I came to teaching 11 years after leaving school & I firmly believe my time spent out in the non teaching world helped me to appreciate how team work is vital to any individual's success. I firmly believe there is no need for every teacher to slog away trying to come up with the best ideas, plans, ways of recording progress, observations of learning or creative ideas. We can learn so much from each other but more importantly, we benefit from being around others who are equally passionate about their chosen career. When I was lucky enough to be involved in the British Council's Comenius (now Erasmus +) programme, I immediately felt the benefit of being in touch with colleagues around Europe who were enthusiastic about their jobs. At our regular project meetings over the 6 years I was involved in projects, I spent many late nights & weekends talking about school with like-minded colleagues, we fed off each other's enthusiasm & shared ideas that have had far reaching consequences for my teaching & therefore every child who has ever been in my nursery class. I always came back from the meeting exhausted but invigorated. I also chose to do further studies after finishing my PGCE and again found that the colleagues I met whilst studying for my Masters were of a similar mind-frame, many were involved in Comenius & we were all definitely those type of teachers who can never emerge from a shopping trip without buying something for school. The arrival of social media introduced me to a whole new set of like-minded colleagues, those who are to be found chatting about school & sharing ideas any evening of the week on Twitter or Facebook. I know many are very sceptical of social media & say things like 'I have a real life, I don't have time for Twitter/Facebook' but they are missing the point. Social media allows me to enrich my life with regular interactions with colleagues who are willing to share good practice & practical help. I always advise those new to Twitter to start following a few key people & watch out for certain # pertinent to their particular age group or level in school. We also get to meet up every do often face-to-face which is even better. I now have many colleagues that are friends who started off as 'cyber acquaintances' and I have yet to ever find out that we didn't get on in real life. I went to my first TeachMeet in Stranmillis College in October 2013 & I was hooked from the first presentation, as I listened to a secondary school colleague talk with such passion about his job and the pupils he taught. I don't mean to be controversial but many teachers outside the early years tend to be quite negative about their jobs & the pupils & I often wonder why they are teaching at all. I have attended every TeachMeet since & put my name down to present as I think we all need to keep sharing our practice to help each other see that small steps can all add up to help us move forward. 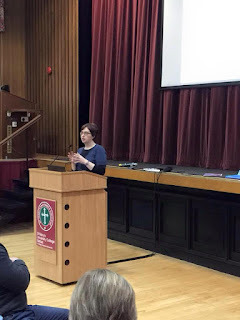 I am excited at the prospect of a bunch of ordinary (well, they are actually pretty extraordinary) educators getting together to take control of CPD in Northern Ireland on August 18th. # niedcamp is the result of funding suddenly being withdrawn from the annual summer school that was run for teachers in N.I each August. The minute the word filtered through to the key movers & shakers they decided to take on the challenge of offering CPD to colleagues for themselves. The idea is that we, ordinary, teachers/educators sign up to present and share ideas/practice with each other or to just attend and hopefully be inspired by each other. Please make sure, if you are free on the 18th, that you come along to see that there is much to be celebrated in the future of education for N.I. There is something very satisfying about seeing brand new playgrounds develop and become more of a reflection of the children who will use them or large playgrounds being made more 'intimate'. Sometimes when people do come to visit our space they are quite shocked by just how small it is, especially when they know we have several zones within the space e.g. 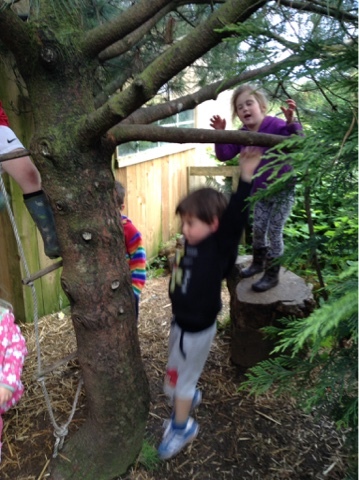 the forest, mud kitchen, campfire, reading, covered area and slides. I would actually say that it is much easier to work with a smaller space than a large open area - that can seem very intimidating for staff as they try to make it more 'lived in'. Our partner school moved into a brand new space and playground in September and immediately found it was too big and open and 'new'! When we would visit with the class of 28 children the space was fine but as they normally have just 12 children in this space normally, they tended to be lost in such a space. We love having a partnership with a special school and always find that everyone benefits from this - staff, parents and children but sometimes we can underestimate how much there school can gain from having us as partners. 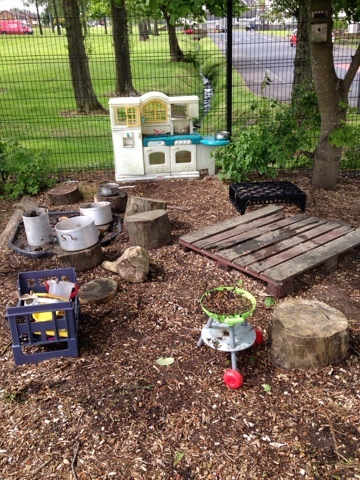 Their staff enjoyed visiting our established playground and seeing how their children interacted with the various challenges on offer - tree stumps, tyres, crates, logs and they were bowled over by the mud kitchen. So today 7 months after we first visited their new space, we had so much fun exploring all the changes they had incorporated in the last few weeks - the space has just become much more interesting by just adding some camouflage netting, saucepans, tyres and a mud kitchen. I can't wait to see how this space evolves in the next 7 months. Earlier in the week I had also had the opportunity to revisit a colleague in her nursery school almost 2 years after I first visited. Her playground is huge - one may early years practitioners would love to have but it was very open and as usual with any big space the children tended to run about. Well, fast forward a few years later and again I was amazed at the transformation - they have been able to fence off a woodland area WITHIN, yes within the playground! 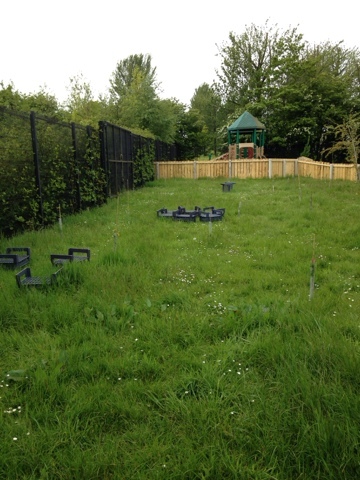 This is only one side of the new woodland area! Now it will take a while for it to be an established wooded area but I know from our experience with Bear Woods, even a 2 foot tree is a tree in the eyes of a 3 or 4 year old child. They also had the cutest mud kitchen area under the canopy of lovely mature trees. 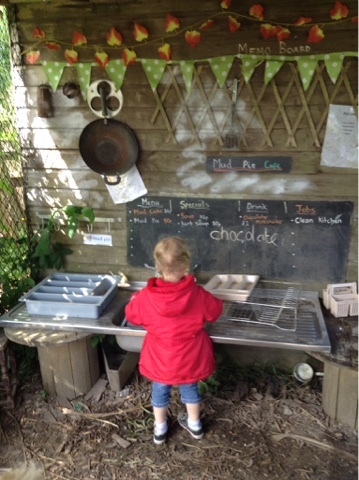 This gorgeous little space shows you don't need to spend a fortune on a mud kitchen, as long the children have somewhere to mix up their 'cooking' they will be happy. Again, I can't wait to revisit this space in another couple of years to see how it has developed. I suppose the purpose of this post is to help anyone who feels their space is uninspiring or thinks they can't achieve anything without lots of money or an established forest area - take a fresh look at your space and any piece of land not being used all the time and dream big! Thanks to Julie, Susan and Julia for being so hospitable and for having the vision to 'go for it'!